[cs_section id=”” class=” ” style=”margin: 0px; padding: 45px 0px; ” visibility=”” parallax=”false”][cs_row id=”” class=” ” style=”margin: 0px auto; padding: 0px; ” visibility=”” inner_container=”true” marginless_columns=”false” bg_color=””][cs_column id=”” class=”” style=”padding: 0px; ” bg_color=”” fade=”false” fade_animation=”in” fade_animation_offset=”45px” fade_duration=”750″ type=”1/1″][x_image type=”none” src=”http://preetnagarresidency.in/wp-content/uploads/2016/05/12247925_1069900893081492_283398283166355019_o-1.jpg” alt=”” link=”false” href=”#” title=”” target=”” info=”none” info_place=”top” info_trigger=”hover” info_content=””][/cs_column][/cs_row][cs_row id=”” class=” ” style=”margin: 0px auto; padding: 0px; ” visibility=”” inner_container=”true” marginless_columns=”false” bg_color=””][cs_column id=”” class=”” style=”padding: 0px; ” bg_color=”” fade=”false” fade_animation=”in” fade_animation_offset=”45px” fade_duration=”750″ type=”1/1″][cs_text id=”” class=”” style=”” text_align=””]What’s most exciting about working with space is that the possibilities are as vast and expansive as space itself! 2014 was the Big Bang of Preet Nagar Residency when we opened up our beautifully envisioned 1930’s style art deco house to artists. At this point the house needed a lot of work but we worked with the character that old buildings carry so well. 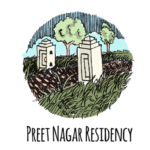 Our first season saw a mix of writers, musicians, performers, photographers & film- makers living as a community at Preet Ghar. We listened to classical and world music as we worked on personal work, collaborations and community projects.